Tablets are getting more and more advanced these days and with the increase in people’s consumption now some tablet manufacturers have also started pushing desktop-graded processors underneath for doing some serious tasks. With that being said, most of the users have now started migrating towards tablets as their main device because of the portability and versatility it offers. However, there is a catch, imagine typing e-mails or blog posts on a tablet by tapping for hours on screen and losing accuracy, no matter some tablets do come with keyboard within the package, but what about those tablets which don’t come with a keyboard. 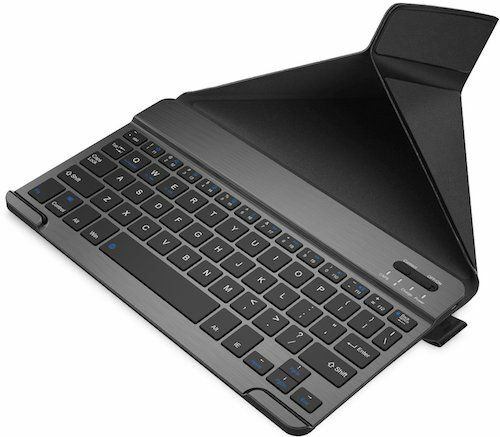 Well, our Tablet Accessories‘ professionals have made everything easy by digging out some of the best Bluetooth keyboards for tablets which are remarkably ergonomic in design and flexible to use with every Bluetooth enabled tablets. Most of the keyboards from our list are universal, meaning they are compatible with most of the Tablets, Phones & Laptops having Bluetooth connectivity onboard. However, as this guide is mainly focused on Bluetooth keyboards for tablets, we will be reviewing them specifically with respect to tablets. One more thing to note that these keyboards are not keyboard-case coupled, so you won’t have that laptop-style transformation. Anyway, those who want to get that transformation can purchase this $10 Portable Multi-Angle Stand to dock their tablet while typing. The Artech Universal is a sleek and ultra-portable Wireless Keyboard which will be compatible with almost every Bluetooth enabled device you throw at it, which includes all the iPads, Android tablets, Smartphones, PCs and even laptops. It is designed with high-grade anodized Zinc alloy on the back which feels really premium and resistive with a plastic brushed panel on the front. Moreover, the backlit keys onboard are whisper-quiet and have enough key travel bringing a whole new level of comfort to your fingertips. The Artech HB030B is currently on #1 Best Seller spot on Amazon due to its ultra-sleek design, battery-life, and compatibility with most of the devices. Most of the keyboards mentioned here use battery-power directly from the tablet, while this Artech wireless keyboard features rechargeable Li-Polymer battery underneath which promises 6 months of continuous usage on a single charge based off 2 hours usage per day which is really impressive for the price it comes. Weighing just 0.4 pounds with dimensions of 9.3 X 5.3 X 0.24 inches, the Artech Bluetooth Keyboard is a very light and portable keyboard to toss in your backpack and carry around. The Artech keyboard is usable straight out of the box and it comes with a USB charging cable, welcome guide, and 24-month warranty in the package. 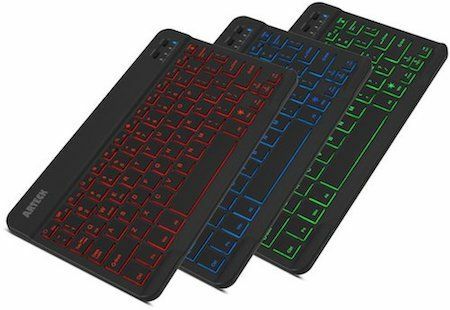 As the keyboard features LED-backlit feature, it can be customized with 7 different colors deep blue, soft blue, bright green, soft green, red, purple and cyan. The only down-side we can notice about backlit is that it doesn’t feature white color which most of the users prefer while typing at night. Overall, the Arteck is one of the best Bluetooth keyboards at an affordable price to hook up with your tablet and other Bluetooth enabled devices. If you own one or more devices, then you should definitely check out the Logitech K480 Bluetooth keyboard. The software that works on this keyboard enables you to create up to three different profiles which can be switched through devices by rotating that round controller on the top-left corner. The integrated cradle at the top of the keyboard holds your tablet or smartphone at a perfect angle to your eyes which in addition will save you a few bucks from buying a stand for your tablet. No matter on what operating system you’re using this keyboard with, you will find familiar keys like command, ctrl, alt and option. Moreover, the keys are round-shaped and ergonomically curved giving you a fine grip and comfort while typing blog posts or E-mails for significantly longer time. For travel bloggers seeking out portability, this 1.8 pounds compact keyboard is very light to throw in your backpack and feels much more practical than typing with touchscreen keys. Moreover, users can start typing with Logitech K480 keyboard right out of the box as 2 AAA batteries come pre-installed on the keyboard. 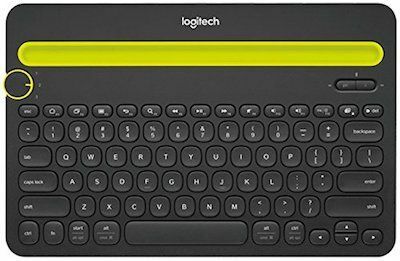 Overall, the Logitech K480 Keyboard is one of our most recommended Bluetooth keyboards for Android tablets as well as iPads, offering great versatility and portability. Made especially for iPads, the Anker wireless keyboard comes with inbuilt Bluetooth connectivity, full-size keys and iOS shortcuts for typing. However, if you have other devices as well, then it also supports Android and Windows operating systems for typing. The keyboard needs to be paired only once, thanks to the Bluetooth connectivity onboard which automatically connects to your previously connected devices on your next session of typing. Talking about the design, the Anker wireless keyboard features matte-finished full-size keystrokes which are very tactile and have enough key-travel for typing. Moreover, the keyboard layout is industry standard featuring all the basic shortcuts and multimedia operations that we use most often. As long as battery life is concerned, the Anker Bluetooth keyboard delivers up to 6 months of continuous usage based off 2 hours of daily usage, which can be recharged with the micro USB cable that comes within the package. Overall, the Anker Universal Bluetooth keyboard is a good compact-sized keyboard not only for iPads but other Android tablets as well. The one thing for which this keyboard by Arteck really stands out is its design and build quality. It is assembled with stainless steel which seems really premium and gives that heavy-duty feeling. The low-profile keys are very tactile and have enough key travel offering the best typing experience ever. As far as compatibility is concerned, it can be quickly toggled between Android, iOS or Windows by pressing shortcuts available onboard. For instance, if you switch keyboard from Windows to iOS then the Control key will work as Command key and vice versa. Though it is built of Stainless Steel, it weighs only around 10 ounces which makes it one of lightest and toughest keyboard on our list of best Bluetooth keyboards for tablets. The dimensions are somewhere around 11.1 X 5.3 X 0.16 inches which are ideal for throwing this out in a backpack. 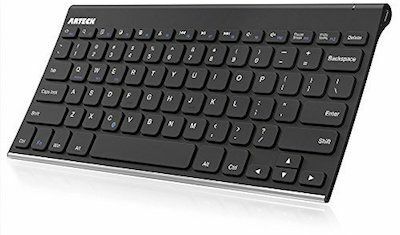 According to Arteck, this wireless keyboard comes with a rechargeable battery under the hood which lasts around 6 months on a single charge based on 2 hours of usage per day which is quite common for most of the Bluetooth keyboard in the market. Overall, the Arteck Bluetooth keyboard is our most recommended keyboard as it offers the best-in-class built quality and broad compatibility. 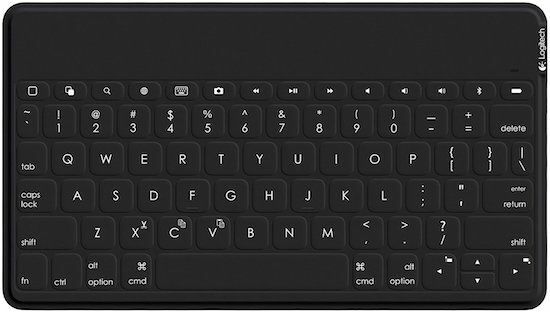 This foldable universal Bluetooth keyboard by Microsoft is one of the most compact keyboards out there which is compatible with Android, iOS and Windows. It works on the latest Bluetooth 4.0 technology which provides high accuracy and consumes significantly less power than the previous technologies. However, the battery here is not rechargeable which according to Microsoft will provide you with around 3-months of continuous usage. 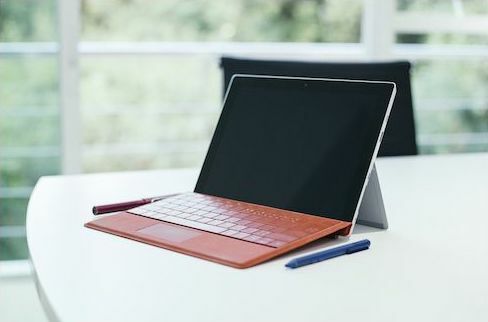 The Microsoft’s ultra-thin designed keyboard weighs only 0.75 pounds and measures around 6.1 x 5.3 x 1.1 inches which is very compact sized and still features all the key-sets and functions that we use often. As it is foldable, it becomes the size of a wallet when folded. Moreover, its power mechanism is pretty straightforward, unfolding the keyboard actives it up and shuts it down when folded. Another design feature is the key-set and fabric on the front are spill-resistant which will help protect your keyboard against those sudden coffee accidents at your desk. Overall the Microsoft Foldable keyboard is the best folding Bluetooth keyboard for people with portability as their primary requirement. The Jelly Comb Folding keyboard is a good alternative to Microsoft’s foldable keyboard for those who don’t want to spend much. 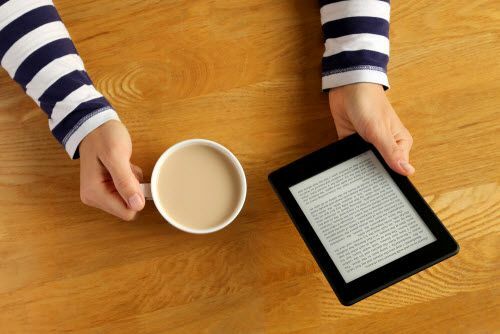 It folds from two sides and becomes roughly the size of a wallet or purse which makes it extremely portable to carry around with your tablet. 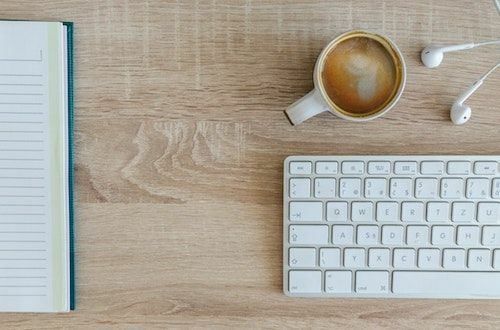 Weighing just around 10.4 ounces, the Jelly Comb Bluetooth keyboard features an ultra-thin matte finished design which according to the company can easily resist normal drops and accidents. The keyboard layout is industry standard which features few additional shortcuts like Play, Pause, Volume, Page Up & Down which will help you to increase your workflow. Moreover, here we also have a Trackpad which makes it, even more, easier to browse through long-lists of files and web pages and gives that laptop like experience while working without comprising productivity. However, readers should note that the Trackpad here is not compatible with iOS which company claims to have plans to fix it in future. As far as battery life is concerned, the Jelly Comb foldable keyboard houses a rechargeable lithium-ion battery which delivers up to 48 hours of continuous typing and standby time up to 560 hours on a single charge. Overall, this Jelly Comb keyboard is the best Bluetooth keyboard with touchpad for typing blog posts, E-mails or taking those important notes at business conferences. If you own an iPad, then this $60 Logitech wireless keyboard has got your back. It is specially designed and optimized for iOS devices which include iPads, iPhones and Apple TV at much lower price than the Apple Smart Keyboard. The Apple Smart Keyboard will cost you around $160 which is almost $100 more than this. The Logitech Keys-To-Go Keyboard features a very slim design which is very durable and spill-resistant, the fabric on the front protects the keyboard from dirt, spills, and drops so that you can use it indoors and outdoors without any worries. Weighing just 6.2 ounces, the Logitech Wireless keyboard is way lighter than the Apple Smart Keyboard which weighs 15.5 ounces. The keys are well-spaced and feature all the iOS shortcuts that you’re used to, multi-tasking, camera, Safari, Bluetooth, play, pause and many more. Moreover, the key-strokes feel, even more, clickier than the Apple’s smart keyboard and have sufficient key travel. This makes the typing experience more positive in terms of accuracy. Pairing with your iPad will be seamless with the Bluetooth technology, just hit the Bluetooth settings on your iPad and tap on Logitech Keys-To-Go and you’re paired! As far as battery life is concerned, the Logitech Keys-To-Go packs a rechargeable battery under the hood which can easily last 3 months based on 2 hours of daily usage. What’s in the box? Well, you get the keyboard itself, a USB cable for charging, documentation and 1-year limited hardware warranty. As the iClever Bluetooth keyboard is a universal keyboard, it is compatible with Android, iOS, and Windows. Users can use this keyboard with their tablets, smartphones and even laptops having Bluetooth connectivity onboard. Pairing can be done seamlessly by accessing the Bluetooth settings of your device. The design of the iClever Bluetooth keyboard is very sturdy and especially the key-strokes feel remarkably tactile and clickier than ever which brings out the most comfortable typing experience ever. Moreover, the keys feature 7 different LED backlight colors with 2 brightness levels which you can adjust as per your requirement. Specifically, the backlight color can be switched to deep-blue, soft-blue, bright-green, soft-green, red, purple and cyan, allowing to adjust the color as per your mood. Like most of the Bluetooth keyboard in the market, the iClever Universal keyboard also features a rechargeable battery which company promises can deliver up to 120-days on a single charge. Moreover, it features a Power Saving feature which automatically takes the keyboard to sleep after 15 minutes of inactivity to save power. 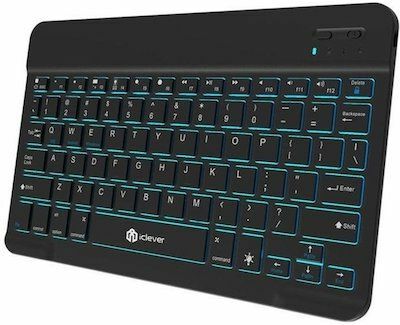 Overall, the iClever Bluetooth keyboard packs all the necessary features, a standard keyboard layout, capability across all platforms and the best thing, it doesn’t break the bank as well. The Nulaxy smart keyboard is compatible with devices running on Android, iOS and Windows having Bluetooth feature onboard. Users just need to pair this up with their device to start typing on the keyboard. The Nulaxy keyboard features a slim and ultra-portable design which enables its users to carry it anywhere especially those travel bloggers who have to document every single thing about the places they travel. Moreover, the keyboard layout is pretty standard as we see on laptops, the keys feel very responsive and clicky while typing. The keyboard lasts over 60 days on a single charge which can be recharged using a cable given within the box. The Nulaxy smart keyboard also features a smart stand which protects your keyboard when closed and can also be used to stand tablets when opened to have that laptop-style transformation for typing. Overall, the Nulaxy keyboard is a good Bluetooth keyboard for tablets which also doubles up as a smart stand. If you’re looking for the cheapest keyboard in the market that you can get, then the $15 Jelly Comb Bluetooth keyboard is a good option. It might look like an aluminum keyboard but it it is entirely built of plastic. However, the design is super-thin and light making it convenient to throw in your backpack. Though it is made of plastic, it can easily resist normal drops, meaning it is enough sturdy and resisitive for everyday usage. The keyboard is compatible with whatever the device you have running on Android, iOS and Windows operating system. The operating system from the keyboard can be changed by pressing Fn+Q,W,E keys on the keyboard. The scissor-switch keys are ergonomically designed giving you a very responsive feedback with a pleasant typing experience. The optimum slope design of the keyboard prevents your wrist from hurting while long sessions of typing. The manufacturer claims that keyboard lasts over 700 hours using 2 AAA batteries which aren’t included in the package. Whenever the battery is about to go down, the LED indicator on the top-right corner of the keyboard indicates in advance so you don’t get locked out in business meetings or while writing important E-mails. Looking for a keyboard exactly like these except that it needs to pair with my new Samsung smart TV, do you know of one. You can pick any of the Bluetooth keyboards from our list as all of them are compatible to use with smart TVs. To connect, just hit the Settings on your TV and open Input device manager > Add Bluetooth keyboard.